Our smallest aircraft is the Cirrus SR20. This aircraft, designed in America is a four seater aircraft made out of composites. It was also the first aircraft created with a build in parachute (CAPS System) to increase the safety of anyone on board in case there is a problem with the engine or if the pilot looses control. The SR20 is also known for its higher then usual performance compared to other similar training aircraft, while still maintaining a comfortable atmosphere. 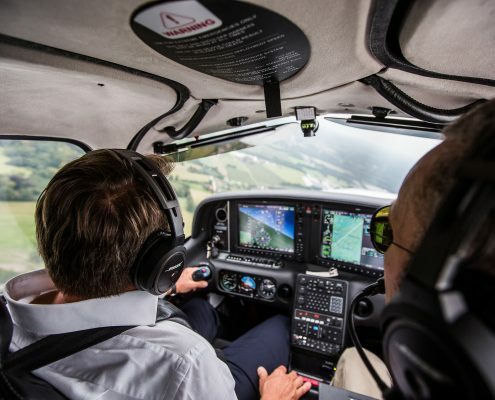 The Cirrus SR22 is designed as the bigger brother of the SR20. It is a further development of the SR20 with a noticeable bigger engine, larger interior and exterior and also state of the art avionics, compared to what you find in modern airliners and corporate jets. The most noticeable items are the engine which has 55% more power (310hp compared to 200hp), a larger wing with more fuel capacity and an enlarged fuselage. 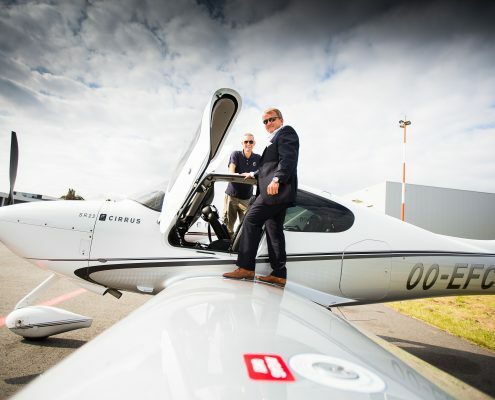 This aircraft is very populair among people who are buying their own aircraft to travel due to its high levels of performance and safety without having high costs attached to it. Our SR22 is equiped with the latest generation Garmin G1000 Glass cockpit. Equivalents to this system is used in airliners and corporate jets around the world. This system creates a high comfort level, from low to high experienced pilots flying it. It features items like a Primary flight display with clearly visible and easy reading flight instruments, a Multi function display and an infrared camera for flying at night. Next to these avionics, our aircraft is also designed with a FIKI de-icing system (Flight Into Known Icing). This system resolves the problem of ice attaching to the wings when flying in colder and humid conditions in the winter by covering the front of the wings, propeller, tail and windsheald with a fluid. An option like this really increases the safety levels and gives you the chance to fly in all weather conditions.